There have been 5 types of beans grown on the farm this year. First we started with Dragon Tongue, a speckled bush bean that was delicious, slightly lemony. We picked for weeks, until the bean beetles found the plants and ate them down to nothing. There is also a small patch of yellow beans, still producing. And along the fence line the beans are growing...the patch where I was stung by a bee in early August is still producing. There are bush beans inside the hoop house and then there are the beans that are climbing to the ceiling of the hoop house. 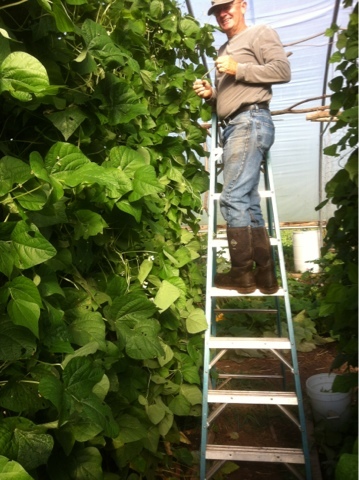 They double back, cross cross, layer upon layer of bean vines and leaves, just beginning to produce enough for harvest. Climbing the ladder is essential for this harvest! Because we use no chemicals of any kind we keep planting. In May, just as soon as the ground warmed, the first set of beans went in. Then, week by week, more went in. We grow this way so that we will continue to have beans to provide to our CSA members for as many of the 26 weeks as possible. The same approach is done with everything else we grow, we plant weekly so there is food to deliver every week. Our selection of open pollinated, chemical free, planted in compost and usually heirloom means productivity is not as great as newer hybrid types. But the beans: they seem happy with this arrangement, and when the plants have stopped producing the chickens are more than happy to eat the ret of the plant, any eggs left on the plants from the insects, and to scratch through the ground for any bits of goodness in there.